Handmade Detroit | Holiday Baar Bazaar Tonight! It’s the sixth year anniversary of the Big Holiday Baar Bazaar and this year’s Holiday Baar Bazaar is going to be a blast – The Majestic Theater will be host to 30+ vendors on Saturday, December 17th from 8pm-1am. 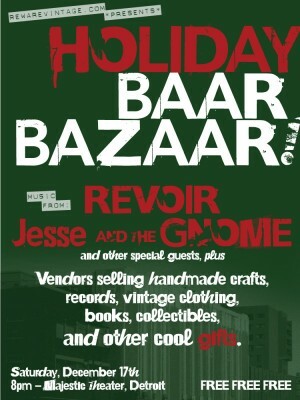 Phil and I are very excited to have Revoir, Jesse and the Gnome, and other special guests playing while you shop! As always, admission is free, doors open at 8pm, and this is an all ages event. Shoppers can get a drink, watch a free show and shop with local businesses, brand new start-ups and collectors of just about everything! 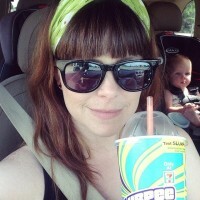 See the whole list of vendors selling after the jump! CDs and Records – proceeds to benefit Forgotten Harvest! Handmade, one of a kind jewelery, stationary, mixed media art, and vintage clothing & accessories. Goth & punk Accessories – Eye patches, necklaces, bracelets, rings, tote bags, hair bows/clips, and mini top hats. The Holiday Baar Bazaar is the original and last bar shopping event of the holiday season, perfect for procrastinators, and is always a fun party. Hope to see you there! Please let me know if there are any current events that I can sell hand made jewelry. There are no upcoming events on either website.